Manual pallet stacker 1000kg capacity and 2500mm lift height. 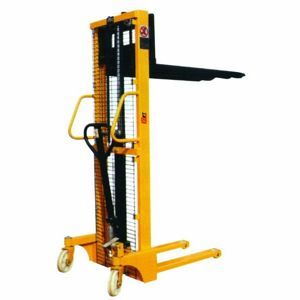 Manual straddle pallet stacker that straddles the pallet so you can pickup and drop pallet from the ground. Two frame rollers and two steering rollers ensures a stable and safe operation. Hydraulic Hand Stacker with Steel Standard Platform.